Families are grateful for Judy’s coffee cart because it provides them with sweet snacks, free of charge. It’s 10 a.m., and Judy Doyle wipes down the side of a coffee cup before offering it to a mom who has been sitting up all night with her child. She rolls her cart down the hallway, gently knocking on patients’ doors and asking parents if they’d like a bagel, or perhaps a donut, from the cart. Thanks to the Parent Mentor Fund, Judy, who serves as the parent advisor coordinator at Akron Children’s, distributes free refreshments to parents or caregivers who have a patient admitted to the hospital. She has been delivering goodies such as coffee, donuts, bagels and fruit for 8 months every Monday and Wednesday, and it has been a hit with parents. After her son spent extended time at Akron Children’s, Judy remembered what it was like to be a parent spending long days and nights in the hospital. 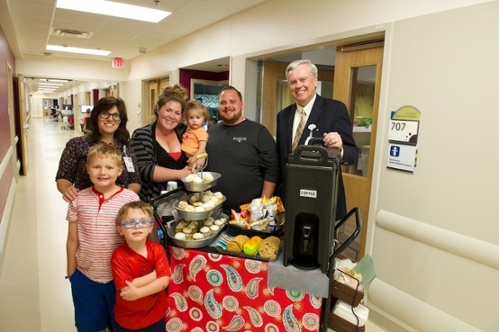 With the coffee cart, she can alleviate some of the difficulties parents face with simple refreshment. The cart offers respite from outside coffee shops or daily cafeteria visits, which can add up, she says. When Judy visits, she provides more than just coffee and donuts to parents, she provides a shoulder to lean on in times of worry and distress. “It’s nice because it allows us to build relationships with the parents in a relaxed atmosphere,” says Judy. One of the perks of her job is getting to know patient families, where she sometimes acts as an unofficial liaison between parents and the doctors. 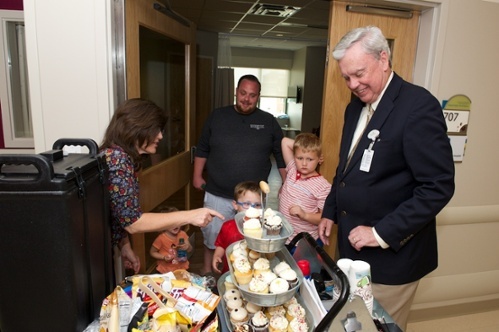 Even William Considine, president and CEO of Akron Children’s Hospital, helps deliver coffee to families. Judy is also able to introduce different families to each other if they have a child struggling with the same condition. In this way, she can facilitate meaningful relationships between families, and provide them with a mutual support system. The cart is helping to create positive relationships between staff as well. Other parent advisors help when they can, like Lauri Esposito. Like Judy, Lauri has a son she refers to as a “frequent flyer” at the hospital because he is multi-handicapped, so she can empathize with parents. Judy or Lauri are almost always around to man the cart, and they even work on holidays. But being the only 2 people who volunteer can be difficult, and Judy urges everyone on the Parent Mentor Board to help out. “There’s potential for it to grow like crazy. We just need more parent mentors to help us staff it,” says Judy.